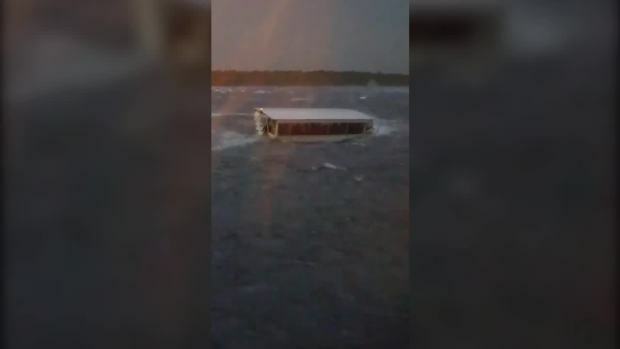 A boat carrying tourists on a Missouri lake capsized and sank during a thunderstorm Thursday, authorities said, leaving several people dead and others missing. Lauren Petty reports. Seventeen people died and seven people were injured Thursday night when a tour boat in Missouri capsized and sank. The country-and-western tourist town of Branson, Missouri, mourned Friday for more than a dozen sightseers who were killed when a duck boat capsized and sank in stormy weather in the deadliest such accident in almost two decades. Divers found four more bodies in Table Rock Lake, bringing the death toll to 17, including nine people from the same family and the crew member who was steering the amphibious vessel. In their initial assessment, authorities blamed thunderstorms and winds that approached hurricane strength. "Branson is a city full of smiles," Mayor Karen Best said. "We have so much fun here. But today we are grieving and crying." Ayers said she understood how the boat got caught on the lake because the weather on Thursday evening changed in 10 minutes from sunshine to gale-force winds that bent traffic signs. "I hope it won't tarnish Branson," she said with tears in her eyes. "About 80 percent of our income comes from tourists. We love them." The weather service station in Springfield, about 40 miles (64 kilometers) north of Branson, issued a severe thunderstorm watch for its immediate area Thursday, saying conditions were ripe for winds of 70 mph. It followed up at 6:32 p.m. with a severe thunderstorm warning for three counties that included Branson and the lake. The warning mentioned both locations. The boat went down about 40 minutes later, shortly after 7 p.m.
Brayden Malaske, of Harrah, Oklahoma, boarded a replica 19th-century paddle wheeler known as the Branson Belle on the same lake just before the storm hit. Authorities did not publicly identify the dead but said they included a 1-year-old child. An email message seeking comment from Ripley Entertainment was not immediately returned.